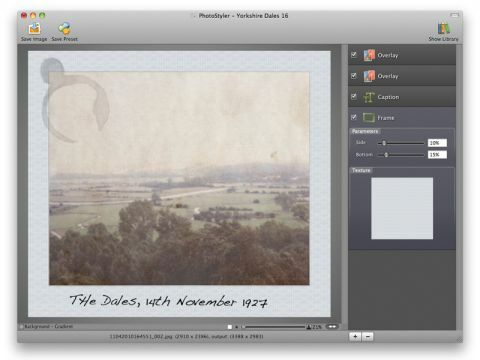 PhotoStyler has come a long way since we reviewed version 2.2, early in 2010. The developer has responded to criticisms about the interface and unMac-like appearance. This new release is far more intuitive and user-friendly, though a couple of niggles remain. It's an easy-to-use app for manipulating and correcting digital pictures. You can apply filters, crop the image, correct its colours, remove noise or scratches, add a frame, skew the perspective and more. Most filters are user-adjustable, so you can, for example, set the strength of an unsharp mask or the size and style of your frame, and they can be chained to create an overall effect. If you want to make your photo look old, give it a sepia tone, make the edges ragged or add an overlay to create a fingerprint or a coffee stain. More than 50 preset filter groups are supplied, and you can save your own for use. A few minor problems keep it from greatness. The interface, although more Mac-like and intuitive than before, still has idiosyncrasies. Adding captions is a chore and when adding a texture from the library, some might not realise you need an Overlay filter first. But if you can get past these minor problems, it's ideal for those who want more photo manipulation options than iPhoto offers.